As soon as the sweet, dense, singular Eastern Oregon-grown Hermiston watermelons hit the market in late July, I try to keep a tub full of ready-to-eat slices close by in the refrigerator, just in case a heat-related emergency arises. But heat and watermelon can be even chummier, I realized last night at an illuminating supper. 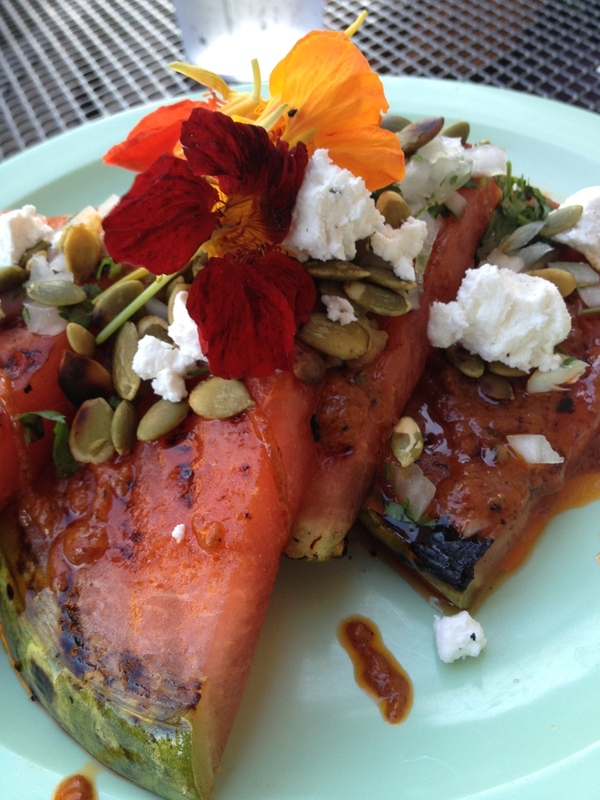 A grilled watermelon “salad,” special du jour du yesterday. Watermelon salads are usually fussy things, with little cubes and precious dots and twiddles and fringes. This was big, luscious slices of watermelon, grilled on a hot fire with the rinds on. Then the slices were topped with pepitas, fresh goat cheese (I think), a simple roasted salsa roja, and a smattering of white onion and cilantro. The pile is crowned with a few edible nasturtium flowers, which add not only fiery glory but a peppery and slightly bitter note. This morning, admittedly high on watermelon, I found an elegant appetizer of salmon sashimi draped over a spiced watermelon refrigerator pickle from the slightly odd blog My Man’s Belly. You can find her recipe linked in the watermelon category of the Punk Domestics preservation collective blog. You might try smoked salmon, homemade gravlax or quickly seared salmon, as well. Oregon salmon, of course. But we can’t stop there. I’ve been saving a recipe from the Bite of Eugene last year for exactly a moment like this, an original recipe that Iron Chef Oregon 2010, our dear Gabriel Gil of Rabbit Bistro & Bar served at the festival and distributed to attendees. Watermelon gazpacho. Yes. It’s a subtle and perfect blend of watermelon and sweet, acidic summer tomatoes, with red peppers, cucumbers, onion and garlic to provide the underpinnings a good gazpacho needs. It was my favorite soup last summer, so I asked Chef Gil (last year, hope he remembers) if I could post it on the blog. And I trust my delay will be your future pleasure! The soup should be started the night before you plan on serving it, since it needs to sit for 12 hours. I suggest using dark, high acid tomatoes and Sungold cherry tomatoes, but any garden tomato is a winner in August. You might want to reserve some of the vegetables for a little garnish in each bowl. Straining the soup through a fine sieve is really an important step for a mind-blowing texture that will make your guests roll their eyes back into their heads in delight, but if you don’t have a sieve and don’t mind a more rustic finish, the blender will do. You will still be loved. In a large container, mix all ingredients well and press on the tomatoes and watermelon, ensuring that they release enough liquid to almost cover the mixture. Cover and place in refrigerator for at least 12 hours. Blend, in a blender, in batches, and pass through a fine sieve. Serve in chilled bowls. Serves approximately 8.